Clip findings/parts are only for demonstration and not included on the sale. 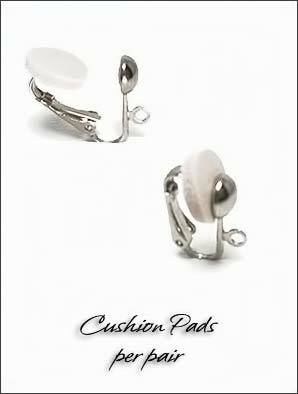 Features: Add a pair of clip earring cushion pads to your non-pierced clip earrings. These pads are recommended for hinged-type clip findings. ;Peel off adhesive pads on the back of these cushions and attach to your clip earrings to prevent discomfort from pinching, aid with metal sensitivity and prevent slippage. 6 pairs of pads. Note: clip on findings are not included. Instructions: Peel a round cushion and place it in the center of the back closure. Press to ensure item is attached securely. Once in place, closure will provide protection and comfort and prevent any slipping. Clip cushion pad is over-sized to provide maximum protection, however it can easily be cut to a smaller size.